Baldy Mountain Bluejays Adaptive Sports offers unique skiing, snowboarding and snowshoeing opportunities for individuals with physical, cognitive and sensory challenges at Baldy Mountain Resort. Our program consists of a team of certified volunteer instructors who are trained to be innovative and creative in adapting teaching methods for our students. Whether our students are stand-up skiers/snowboarders or sit skiers, we are prepared to “see the ability” and adapt to their needs. We expect to expand to 4 seasons of programs as we grow, so let us know if you’re ready and wanting more mountain sport programs. “ I started teaching skiing at Baldy in 1976, and have been a member of the CSIA since 1980. It is fun and rewarding sharing one’s passion for skiing and this mountain. My adaptive teaching experiences have been the most rewarding. Decades ago, I had the opportunity to work with a girl who has Down Syndrome. Her parents and siblings all skied every weekend. We didn’t have an adaptive program at that time, but our Ski School Director assigned a different instructor to Sharon each week, to draw on the skills and tricks of our team. Sharon was a delightful girl, and very much distracted looking at the scenery and people around her. When it was my turn to work with Sharon, I managed to teach her how to turn in one direction. The instructor the following weekend taught her to turn the other direction. It was so rewarding to see her a few weeks later, at the top of the Baldy Tee, skiing with her family. 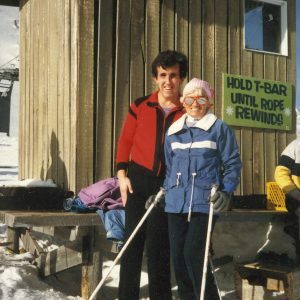 In 1985, Baldy hosted the BC Winter Games ski events, including the “disabled” skiing. The GS race course for an able-bodied competitor took less than 2 minutes. Near the end, we were waiting for a competitor on the course – she was blind, and skiing a basic snowplow, but when she crested the top of the last pitch, the crowd cheered and clapped her to the finish. Here race time was about 15 minutes. Many tears in the crowd. A local man was an awesome skier, and he was severely injured in an accident. When he was ready to ski again, I did some research, and he went to the Vancouver office of the disabled skiing organization. He came back to Baldy with a pair of outriggers, to ski on one leg, but had to figure out what to do with the other leg – the knee was fused. His adaptation was a cross country boot and binding attached to a ski tip, so the injured leg could drag behind. Another instructor and I took turns with the outriggers and one ski – we did the falling, and he was able to use what we had learned without falling himself. Another heart-warming moment when he was back skiing the “big hill” a week later. A few years ago, I worked with a visually impaired autistic boy. He was staying on the mountain with his skiing family. I was able to get him to enjoy the glide of straight running – with all his family cheering him on. I will always remember his giggles when he skied into my arms. 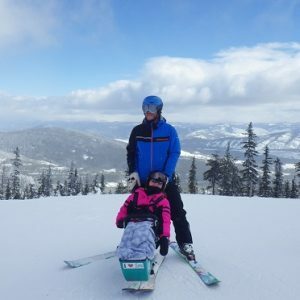 Last winter, I shadowed Bryce with young Megan in a sit ski. 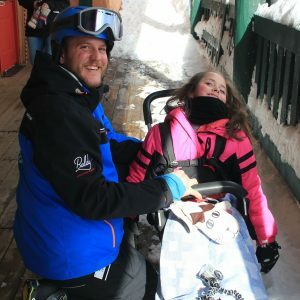 Sharing her joy was amazing – she didn’t want to get out of the sit ski at the end of the day, and I witnessed her request to hug Bryce, and their special quiet moment.